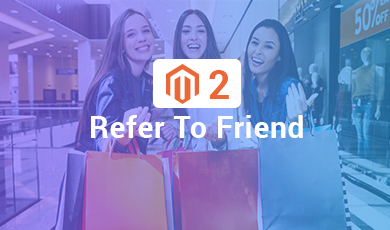 Magento2 Refer To Friend is an extension developed for Magento® 2.x.x. It allows the registered front-end users to invite their friends to the Magento Store and earn the discount coupons. Thus, it helps the admins to increase their sales. This extension allows admin to manage the referral amount, sign-up amount, denomination amount, and the denomination rules. 1. 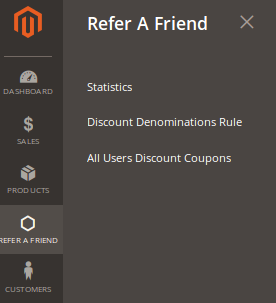 Allows front-end users to refer their friends and avail the discounts, once the referred friend registers to the Magento2 store. 2. Users get the reward points and their friend gets the signup bonus. 3. Admin can view the list of the referred users. 4. Users can convert the earned points to discount. 5.  Helps in generating sales thereby revenue on the site. – After installation of Magento2 Refer To Friend, you can again enable your compilation. – After installation of Magento2 Refer To Friend, you can re-enable your cache. 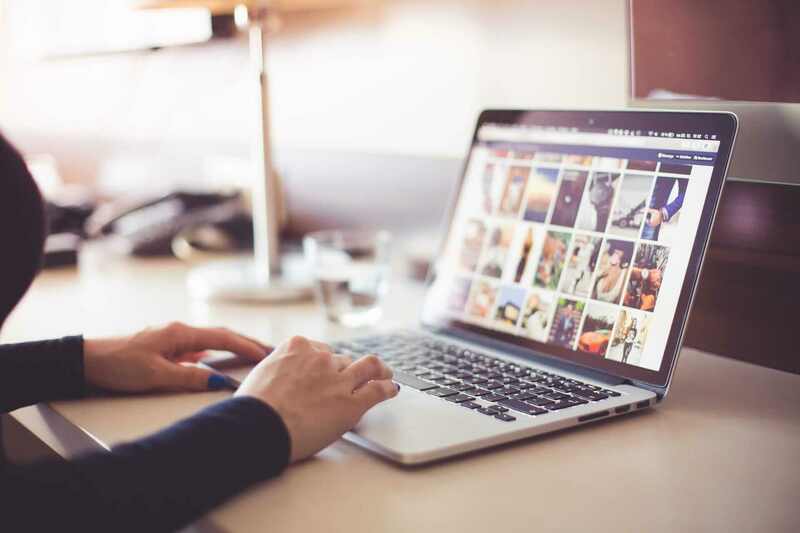 – Before installation of the Magento2 Refer To Friend extension, you can take backup of your database if any issue occurs during installation so you can revert back your database backup. – To install the Magento2 Refer To Friend extension from the Magento-Connect you just need to go to the relevant page where the Magento extensions are available. Then choose your platform and copy your extension key. – Now go to the admin site of the Magento site and go to the system > Magento Connect > Magento Connect Manager. Login to the downloader platform. – Paste your key to the below highlighted area and click on install. After clicking on install of Magento2 Refer To Friend you will see the details of the extension with its version you can proceed and your extension will install in a few moments. – When you purchased the extension from our official site you will get the full package of the extension. Go to the package downloader wizard (Magento Connect Manager). – Go to the section “Direct Package File Upload” and browse for the package then click the upload button. This will install the Magento2 Refer To Friend extension you can monitor the progress in the console area bottom. – If you have any issue with the installation of the Magento2 Refer To Friend process in the above two methods you can use the native installation method by FTP. Connect your FTP and go to the root directory of the Magento installation. Unzip our package which you get after purchase. You will get two folders “Step 1” and “Step 2”. Upload all the files from “step 1” to the root directory first, after the upload of the “Step 1” upload all the files of the “Step 2”. Once the admin installs the Magento2 Refer To Friend extension successfully on the Merchant’s store, the admin has to set up the configuration settings required to enable the features of the extension. 2. On the left navigation bar, click the STORES menu, and then click Configuration. 3. In the left navigation panel, click the REFER TO FRIEND menu, and then click Configuration Settings. a. In the Enabled list, select Yes to enable the extension features on the admin panel and also on the front-end view. b. In the Signup Amount box, enter an amount that the admin wants to allow it to a new user on signing up. c. In the Referral Amount box, enter an amount that the admin wants to allow it to the user who refers to the friend, and the referred friend registers to the store. d. In the Denomination range box, set the denomination range for generating the discount coupons. For example, if the denomination range is 100, then the user can generate the discount coupons in the multiples of 100.
e. In the Expiration Of Discount Code (In Days) box, enter the number of days to specify the validity of the generated coupon. f. In the Support Email box, enter the email id that admin wants to use for sending invitation emails. g. In the Default Message box, enter a default message that the admin wants to use for sending invitation emails. 2. On the left navigation bar, click the REFER TO FRIEND menu. 3. Click Customers Referrals Report. Customer Email: Email id of the front-user who refers to the friend to get registered to the Magento Store. Pending Amount: The balance amount that belongs to the user after generating the coupons from the total amount allotted. Referral Count: The number of friends the user had referred. On the Denomination Rules page, admin can create the rules for the discount coupons that are applicable when the front-end users generate discount coupons. 2. On the left navigation bar, click the REFER TO FRIEND menu, and then click Denomination Rules. Rule Name: Name of the rule defined. Discount Amount: The amount assigned as a discount amount when the user purchases the products on the specific amount that the admin defines while creating the rule. Cart Amount: The total purchase amount. 3. Click the Add New Rule button. 4. In the Rule Name box, enter a name of the rule. 5. In the Discount Amount box, enter a discount amount. 6. In the Cart Amount box, enter the purchase amount on which the rule applies. 7. In the Status list, select Enable to enable the rule. 8. Click the Save Rule button. 3. Scroll down to find the required rule for editing. 4. In the Action column, click the Edit link. 5. Make the changes as per the requirement, and then click the Save Rule button. Admin can delete the selected rules and also can enable or disable the rules in bulk. 3. Select the check boxes associated with the required rules. 4. Click the Arrow button next to the Actions field. 5. In the Actions list, click Delete. The selected rules are deleted and a success message appears. 5. In the Actions list, click Change status. 6. Click Enable to enable the selected rules. 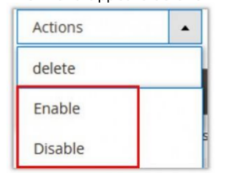 Click Disable to disable the selected rules. Coupon Code: Coupon code generated by the user. Amount: The used amount for which the user had generated the coupon code. Created Date: The coupon generation date. Expiration Date: The coupon expiration date. A front-end user can invite friends to register themselves to the Magento store. 1. Go to the Front-end View. 2. In the left navigation panel, click Invite Friends. Note: The Invitation Url and the code are available by default. 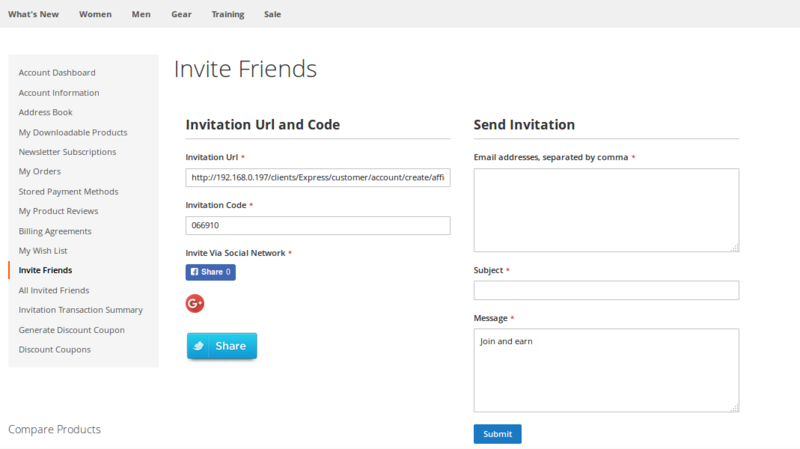 The user can also invite their friends using the social media network such as Facebook, Google+, and Twitter. In the Email addresses box, enter the email ids. In the Subject box, enter the subject of the email. In the Message box, enter the message. 2. In the left navigation panel, click All Invited Friends. Total Pending Referral: Total number of pending invites, those who have not yet joined the store. Total Registered Referral: Total number of invitees, those who have registered themselves to the store. Total Earned Amount: Total amount earned by getting all the friends registered to the store. Email Id: The Email Id column displays all the email ids of the registered invitees. Name: The Name column displays the names of the registered invitees. Status: The Status column displays the status of the invitees, whether joined or pending. Invited Date: The Invited Date column displays the date when the user had sent the invite. 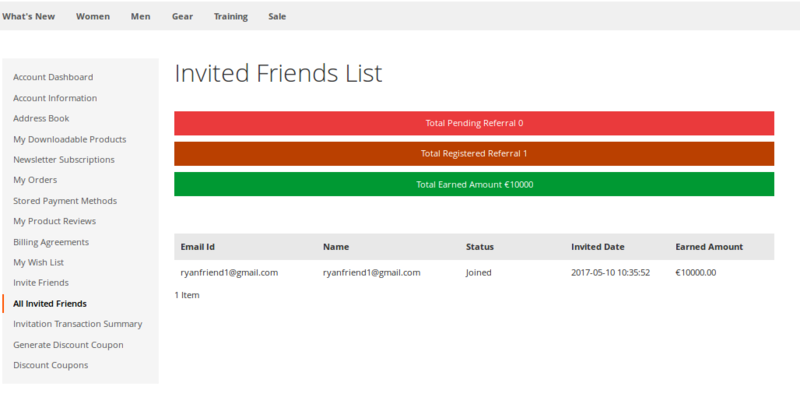 Earned Amount: The Earned Amount column displays the amount the user has earned by getting the specific invitee registered. The Invitation Transaction Summary page displays the transaction details of the user. 2. 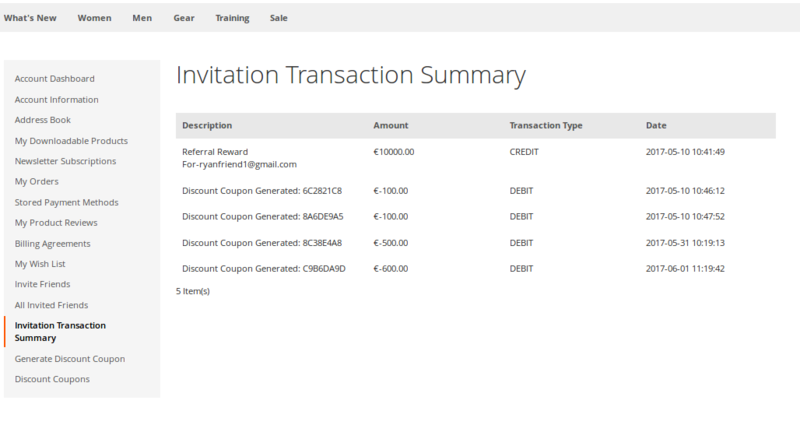 In the left navigation panel, click Invitation Transaction Summary. Description: Displays the description of the transaction held on using the earned amount while purchasing the products by generating the coupon code. Amount: Displays the amount credited or debited. Transaction Type: Displays the transaction type, whether CREDIT or DEBIT. Date: Displays the transaction date. On the Generate Discount Coupons page, the user can generate the coupon codes from the total referral earned amount to use it while online shopping. 2. In the left navigation panel, click Generate Discount Coupon. 3. Under Generate Discount Coupon, in the Discount Coupon list, select the required amount to generate the coupon for. The Discount Coupons page displays the details of the generated coupons. 2. In the left navigation panel, click Discount Coupons. Coupon Code: The generated coupon code. Amount: The amount for which the coupon has been generated. Created At: The date and time when the coupon has been generated. Expiration Date: The date and time when the coupon expires. Purchase Required: The purchase amount on which the coupon code is applicable.